which means God with us. 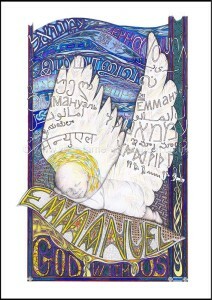 This piece was inspired by the Michael Card song, ‘Immanuel’. I have included the romanised version of the word Emmanuel or it’s translation ‘God with us’ in many different alphabets to show that God came to earth and remains in the form of the Spirit, for everyone, regardless of race. We are all God’s children and loved equally and beyond measure. "A sign shall be given, a virgin will conceive, a human baby bearing undiminished deity. The glory of the nations, a light for all to see that hope for all who will embrace His warm reality. Who could stand against us? Please note actual print margins may differ from the website displayed image. We have endeavoured to make the image as large as possible for the print so in some cases the margins around the print differ from the artwork shown.